Detroit Public Schools (DPS) face a number of challenges, including budget cuts, school closures, and the expansion of public charter schools, which coupled with the district’s multi-million dollar budget deficit, mean that students in the system suffer – they rank lowest in standardized testing in the nation’s urban districts. Brooke Franklin from the Detroit Regional Chamber (DRC) was hired as Director of K12 Strategic Partnerships for the DRC’s Education Engagement Project. She recognized the opportunity for K12 educators and business leaders to form partnerships that would increase resources for DPS. Supported by a grant from the Skillman Foundation, Brooke spearheaded a DRC advisory council to develop infrastructure that would link district schools with the business community – resulting in Businesses/Organizations Optimizing Learning in Detroit (BOLD). In 2010, DPS incorporated BOLD’s efforts, and in 2011 the DPS Volunteer Business Corps was launched, integrating business expertise and volunteer activism and bringing it to the classroom. The program creates partnerships that strengthen education in the district by aligning academic skills with workforce needs. The partnerships provide resources that include tutoring, mentor programs, extracurricular or career training, and school infrastructure beautification. The program has since surpassed its goal of at least one partnership with each of the district’s 141 public schools, and its collaborative efforts continue to offer educational opportunities in Detroit Public Schools. Brooke, an education consultant for the Detroit Regional Chamber, developed the BOLD program, the initiative behind the DPS Volunteer Business Corps. As a former school teacher with a background in both the corporate and non-profit sectors, Brooke embodied the resourcefulness and ingenuity needed to design the collaborative program. Brooke began working in the private sector because “there were already too many educators in the family.” She started off in the hospitality industry, generating sales and revenue for large hotels, but charter school legislation prompted a change in her career. The 1994 Michigan Charter School Act created new publicly-chartered academies with the operational autonomy of private schools. The Act offered students an alternative to traditional public schools and educators more freedom in their curriculum. Brooke saw this as an opportunity to pursue education and left her corporate job to become a teacher. She felt compelled to work as her school’s first Community Liaison, encouraging businesses and non-profits to take a more hands-on approach to education. Brooke continued this objective on a larger scale at the Michigan Association of Public School Academies, linking the business and civic community to schools throughout the state. Brooke always felt like she wanted to be involved in the field of education. For three years, she taught kindergarten in a public charter school, where the majority of students live at or below the poverty line. Brooke was inspired by a hands-on approach to education; when one of her kindergarten students asked, “What is a cow?” Brooke organized a field trip to a farm. She became her school’s first Community Liaison. She forged relationships within the business community to assist schools, recognizing the ability of joint efforts to have a lasting impact for students. Following her Community Liaison position, Brooke worked for the Michigan Association of Public School Academies, an association that now serves 255 charter schools in Michigan. Seven times a month, Brooke arranged meetings with 12 to 25 administration leaders. They discussed the specific needs of individual schools and how to find the resources to fulfill those needs. Identified as a “source for resources,” Brooke would also bridge network connections in the public and private sectors to find new ways to support Detroit charter schools. These experiences provided her with a broad professional network of individuals she later called upon when forming the model that has made the DPS Volunteer Business Corps a success. Brooke’s proficiency in connecting business leaders to public school staff and students comes from her exposure and ability to translate across sectors. She believes the first steps needed to maximize a successful partnership is to understand the “What’s in it for me?” mindset from each stakeholder. Brooke then determines if that motivation is compatible with other stakeholders and to the partnership as a whole. As a sales manager and event planner for large hotels, Brooke gained firsthand knowledge about customer service and the “bottom line” mentality. As a teacher in one of Detroit’s public charter schools, she understood the challenges in her students’ education due to outdated school materials and poorly equipped academic facilities. 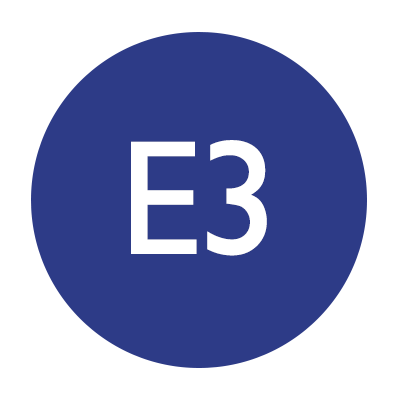 As Director of the Education Engagement Project in the Detroit Regional Chamber, Brooke led a taskforce to engage business leaders and government legislators to generate educational collaboration in the district. She showed business leaders that good schools did exist in Detroit, but the conditions for learning were very poor. She met with principals to discuss what they needed for their school on an individual basis, not what the district needed overall. Once a partnership is set up, each stakeholder needs to recognize the parameters in working with the other parties. In this regard, Brooke calls herself a translator; she teaches K12 educators how to understand the business world, and business leaders how to understand the K12 school environment. Brooke recognized that one of the most challenging parts in implementing the BOLD program involved rebuilding trust from the business community to district schools. Businesses had a history of donating funds to district schools, but in some cases these contributions were ineffective in promoting significant change within a school. Brooke brought together various stakeholders from businesses and non-profit organizations to participate in the DRC advisory council, creating a forum to talk honestly about past challenges to DPS partnerships. She also held monthly tours for business leaders of schools that had academic gains and promise for future achievement. The advisory council brainstormed ideas about how the business community could re-engage with district schools. They mapped guidelines to develop successful collaborative projects with DPS. By creating and setting guidelines within the BOLD model, Brooke and the DRC advisory council were able to rebuild trust between the business community and the district. In January 2011, the DPS Volunteer Business Corps program was launched at a kickoff event at Renaissance High School, where business leaders learned how to build educational partnerships with the district. The program serves as a brokering organization between stakeholders, forming a partnership with a school in one of two ways. A business could “adopt” a school that shares a similar interest. For example, WJBK Fox 2 News has partnered with the Communication and Media Arts High School. On the other hand, a school principal can detail specific academic requests by filling out a Partnership Assessment Plan. Based on a number of factors that include location and resources, the DPS Volunteer Business Corps would assign on a case-by-base basis a business or non-profit organization that best aligns with a school’s needs. The BOLD program also established a Partnership Leadership Team in each school. The Partnership Leadership Team is a “safety net” of three individuals who maintain working lines of communication with the business and prepare the necessary accommodations within the school. These representatives are the principal, a teacher/designee, and a parent. If the principal is occupied and can’t assist with the collaboration, there is always someone else to take his or her place. A common objective of all of these stakeholders is to improve education in Detroit Public Schools by aligning the skills taught in the classroom with the needs of the workforce. The students face many educational challenges, from increasing standardized test scores to developing the math and reading skills they will need as adults. Detroit businesses and non-profit organizations have a vested long-term interest in supporting the schools, as the students will one day grow up and join Detroit’s workforce. For example, Cody Academy of Public Leadership connects students to enriching real-life experiences outside of the classroom, such as volunteer activities with a mentor at Big Brothers/Big Sisters, and internships and potential employment at Deloitte and Ernst & Young. 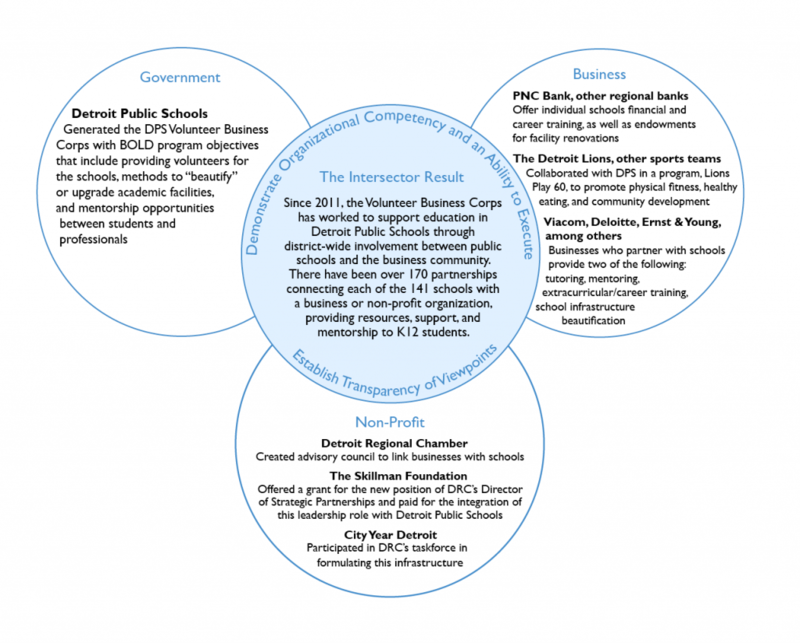 Since its initiation, DPS Volunteer Business Corps has surged in partnerships, some of which have drawn media and public attention to the collaborative process. Fifth Gear is a motorsports education program that engages DPS students to learn science and mathematics in topics centered around racing. Under the stewardship of the Detroit Public Schools Foundation, Fifth Gear is sponsored by PNC Bank’s Grow Up Great initiative and hosted by the Chevrolet Detroit Belle Isle Grand Prix. Through this initiative, kids actively learn their science and math curriculum through engaging activities in motorsports. Detroit professional sports teams have also received media attention for their participation in the cause. The National Football League Detroit Lions’ “Living for the City” initiative, in partnership with several local community organizations, provides students with vouchers for fresh foods, as well as cooking lessons. The football team also supports Lions Play 60, a program that teaches kids through “playtime” how to respect one another and make the right choices. These high-profile partnerships have generated greater awareness of the DPS Volunteer Business Corps and its legitimacy in providing resources to students. In 2012, the Lear Corporation sponsored a three-year $1.5 million tutoring program between high school students at the East English Village Preparatory Academy and their younger counterparts at the neighboring J. E. Clark Preparatory Academy. In 2012, the Detroit Pistons and PNC Bank provided funds to renovate a classroom with new furniture, computers, and supplies and turn it into a “Live, Learn and Play” center at the Blackwell Institute, a school for pre-kindergarten to eighth grade students. In 2013, the non-profit organization Get Schooled and its partner Viacom launched a Get Schooled Attendance Campaign, a competition in the district that encourages school attendance. Durfee Elementary-Middle School was the winner with the highest attendance scores; nearly every eighth grader “checked in” on a school computer and participated in the campaign. TCF Bank representatives have offered financial skills to eighth graders at the Clark Preparatory Academy. Sponsored by the American Bankers Association’s Teach Children to Save Campaign, TCF Bank have taught kids how to balance a budget through engaging survivor island scenarios.